Malaika Arora and Amrita Arora's latest Instagram workout video will make you want to hit the gym with your sibling. Malaika Arora is a mother of two but still looks fit and radiant. The actor is a fitness enthusiast and keeps sharing pictures of her fitness regime on Instagram. Seems like her workout partner is her sister Amrita Arora. Malaika recently shared a video where the two sisters can be seen working out. 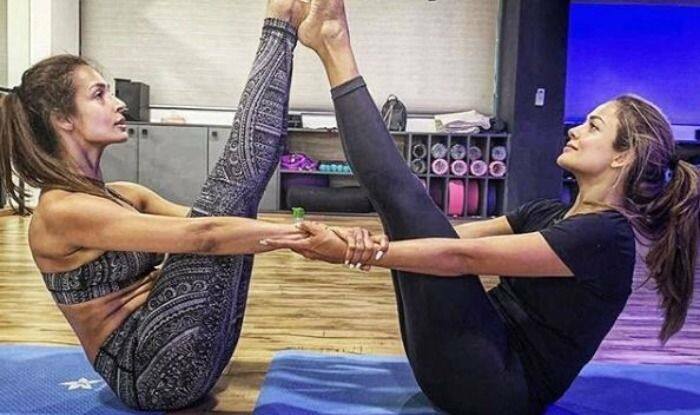 Malaika and Amrita keep setting sibling goals with their workout pictures and videos. Malaika took the video to her Instagram handle and captioned it, “#malaikasmondaymotivation with @amuaroraofficial curtsying away into the week …. love the guest appearance @surilyg  @reebokindia”. Malaika and her rumoured boyfriend Arjun Kapoor were spotted a few days ago outside a hospital in Mumbai. The couple usually greets the shutterbugs but this once, they avoided the paps by walking away without a wave or a smile. Earlier, Malaika was in the Maldives with her girlfriends and Arjun. Initially, there were speculations that she was celebrating her bachelorette in the Maldives ahead of her wedding with Arjun. A few days later, Arjun took to his Instagram to share pictures from the Maldives vacation which proves that they were together.